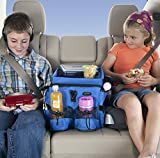 Put the brakes on backseat boredom with a spacious kids snack tray, play station and insulated cooler organizer – all in one large capacity back seat organizer for kids. 10 pocket storage for games, cords, drinks, earphones and more. Keeps kids entertained on car vacations or cross town commutes. High Road has been designing attractive car organizers for more than 35 years from offices located in Portland, Maine. We now have more than 80 problem solving products to reduce car clutter in the rideroom. We pride ourselves on great customer service and quality products. Put the brakes on backseat boredom with a spacious kids snack tray, play station and insulated cooler – all in one large capacity seat organizer!